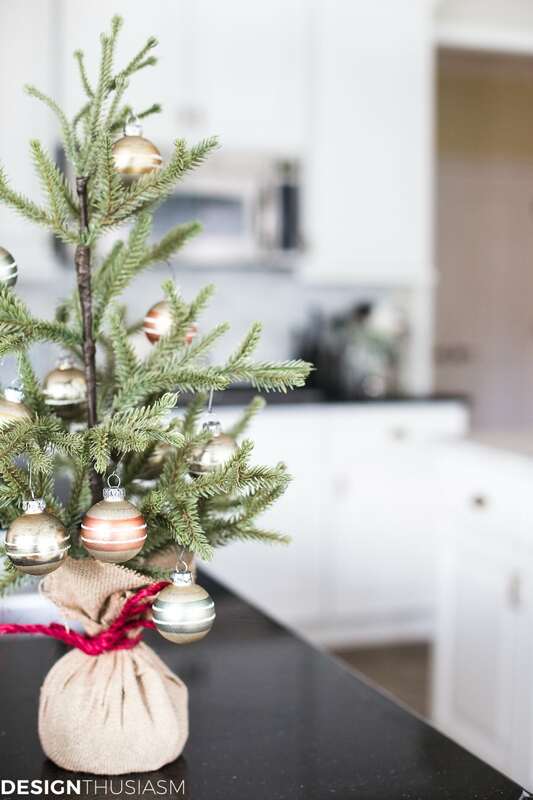 Do you bring the holidays into your kitchen? Or is your workhorse kitchen too cluttered to even see decor you might add there? I love to decorate the kitchen with a light hand and in my blazing white kitchen, a little goes a long way. 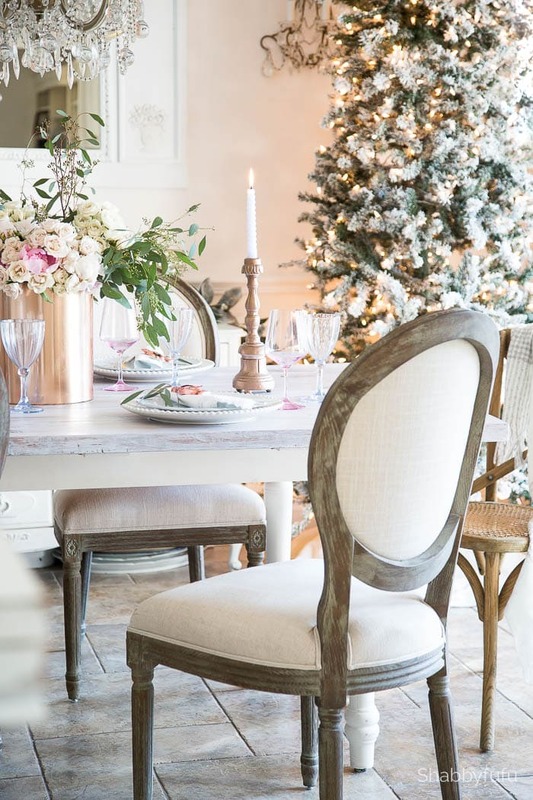 Here are 7 ideas for bringing Christmas into your French Country (or really any style) kitchen. 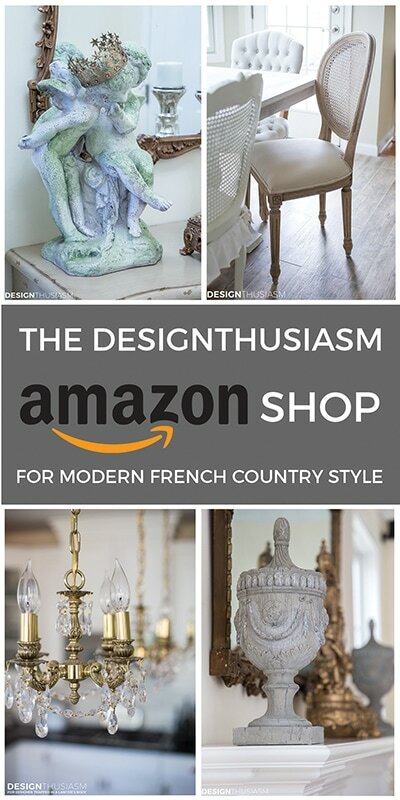 Today I’m joining with six other bloggers in our French Country series to share ideas and inspiration for holiday decorating. Please be sure to visit all the other blogs linked below, as each one is more beautiful than the next. 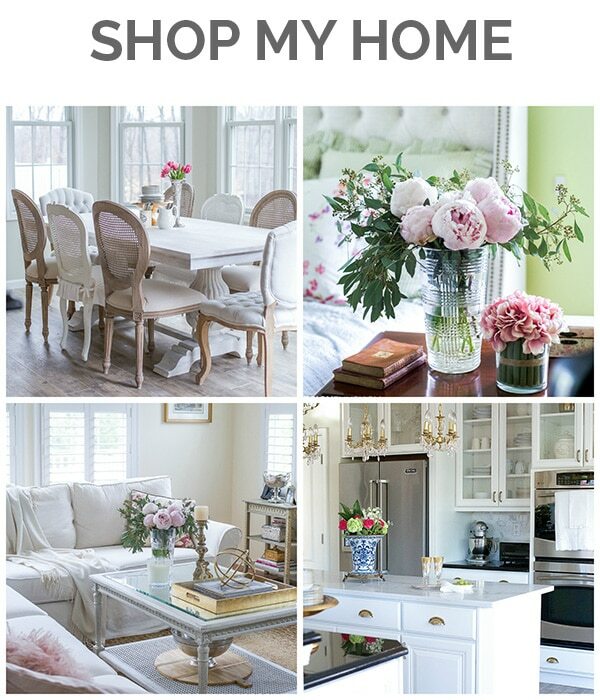 One of the things I most enjoy about a white kitchen is that you can accent it with any color you choose. 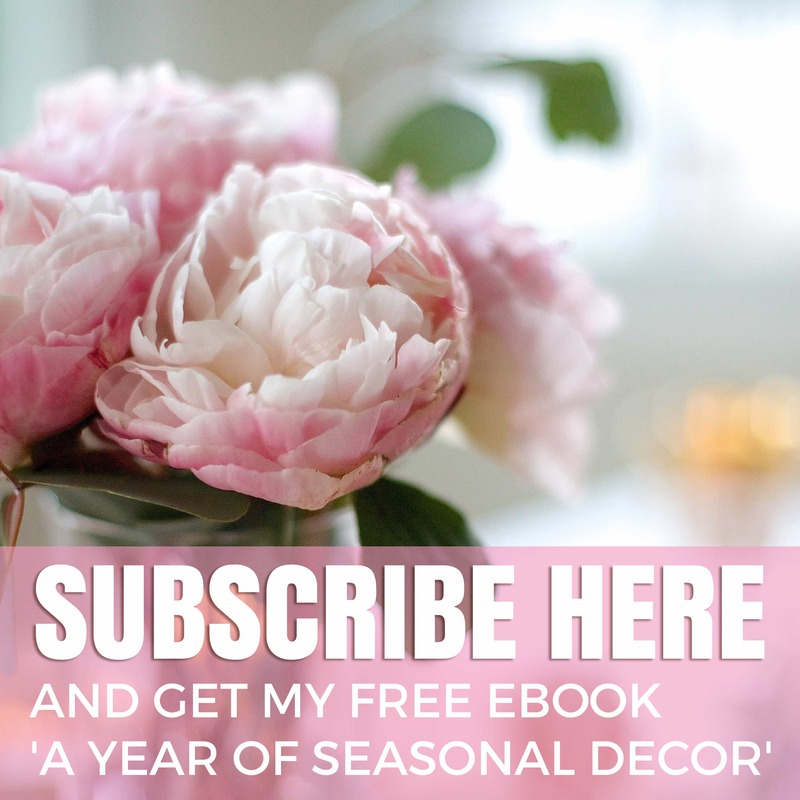 It’s quite easy to change the look from season to season and adding touches of color here and there can make a pretty big impact. This year I’ve decided to add mostly natural elements, as they feel the most suitable to me for a kitchen. Yes, a stray bauble here and there punctuates the look, but primarily I’m working with fruits and florals. I’m not one to drape huge garlands across my cabinets and instead went for soft and gentle holiday hints. 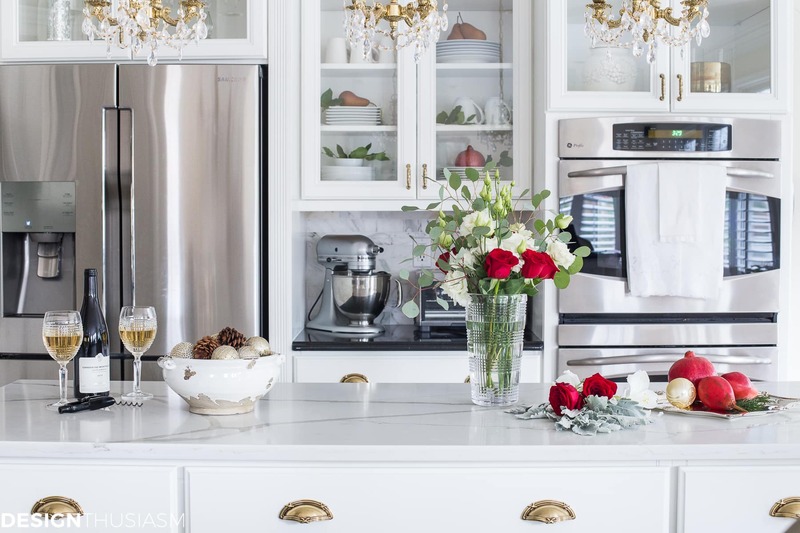 I wanted to work with the vintage French elements that are already in my kitchen and highlight them rather than drown them out. 1. Pomegranates and greens in a silver bowl – I keep several bowls around my kitchen for various uses and I love filling them with seasonal fruits. We’re a bit early in the season now, so I couldn’t find fresh cedar, but I love the look of pomegranates with greenery peeking over the edges. 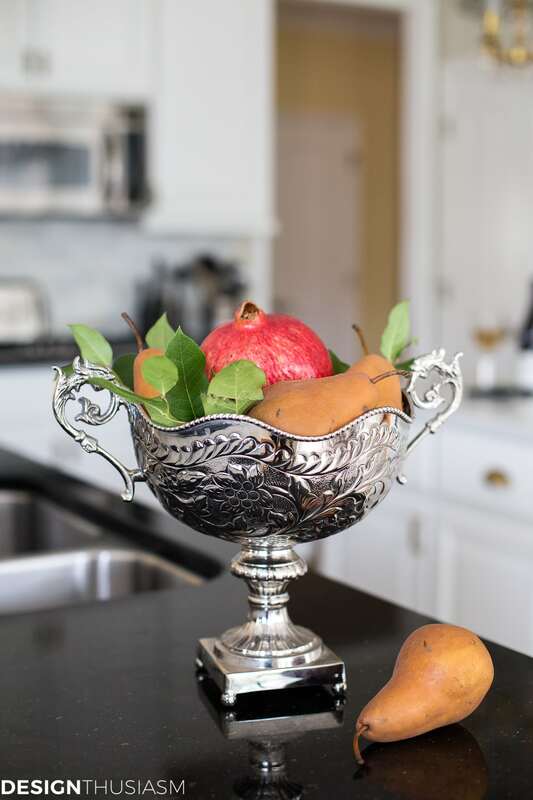 This footed silver bowl has a sculptural quality that works nicely with the unusually shaped fruits. 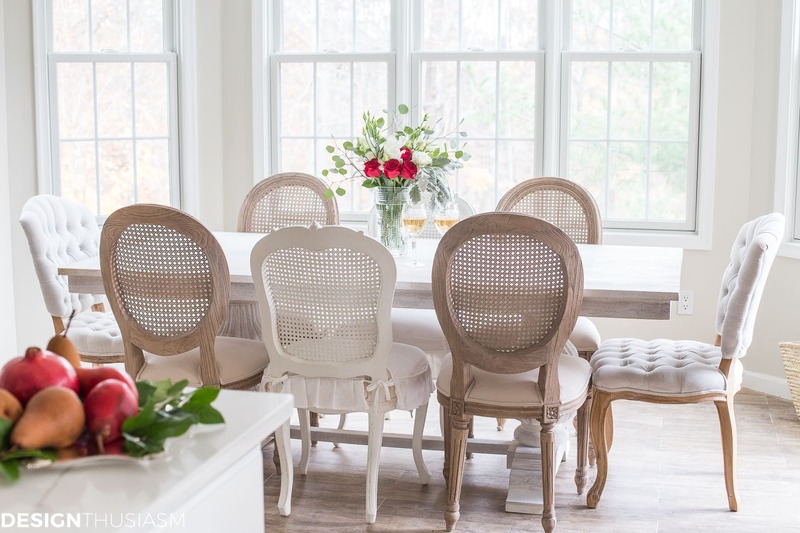 Our kitchen is in the center of our home and is open to the family and breakfast rooms, so I think nothing of serving guests around our island. I have friends who prefer not to serve guests in the kitchen but for us, it’s seamless with the flow of our entertaining. 2. 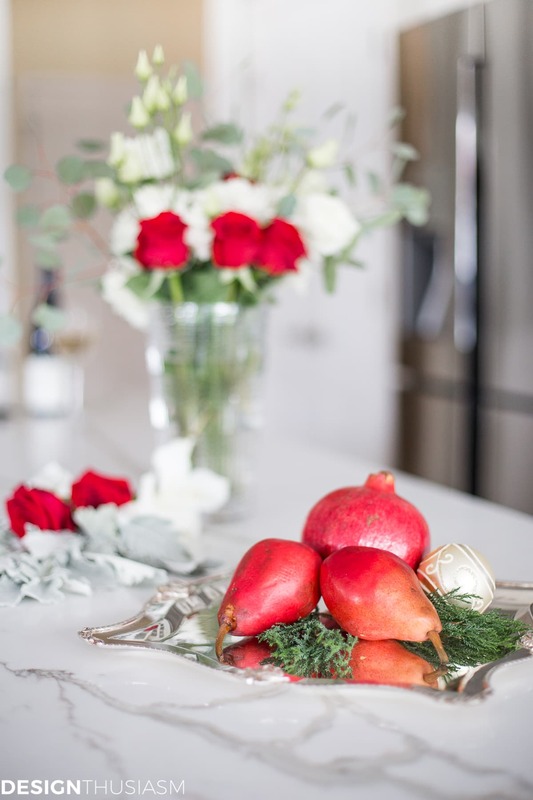 Red pears on a beautiful tray – I was delighted to find red pears at the grocers this year and thought they’d look wonderful on a silver tray. 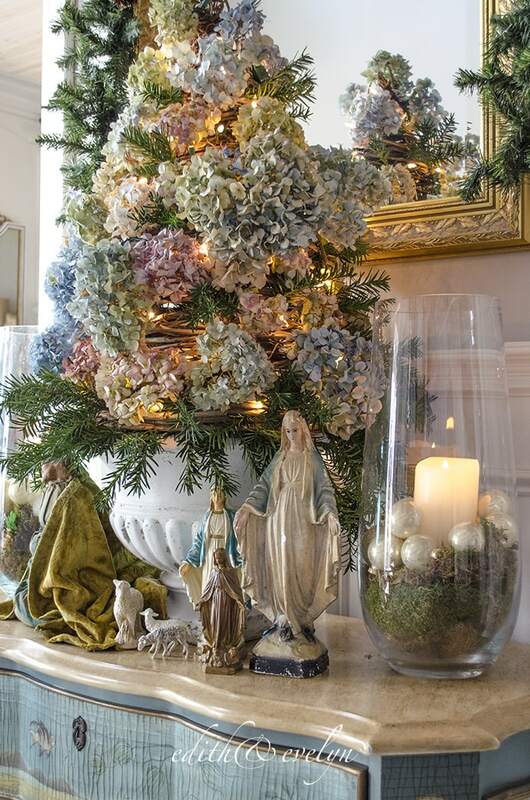 A few sprigs of juniper and an ornament or two round out this pretty little vignette. 3. 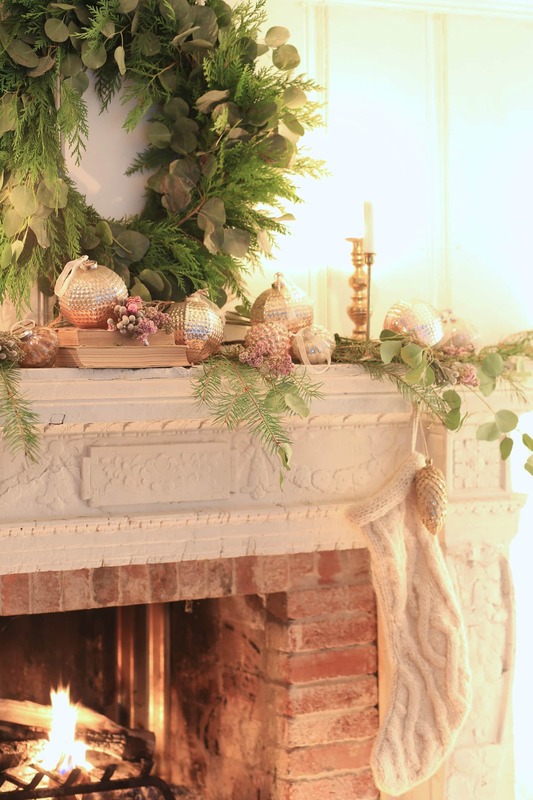 A bowl of baubles and pinecones – Tucked in the corner I have a low distressed bowl which looks lovely filled with glittered holiday orbs and pinecones. 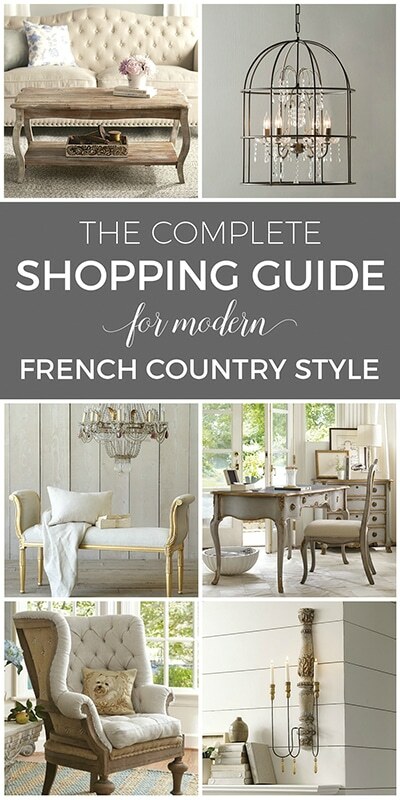 One of the most telling features of my signature French style is mixing contrasts like chippy with glam. The vintage marmalade jar embodies this look, as it’s paired with silver and mother-of-pearl spreaders. This mirrors the tone set by the glam baubles resting in a timeworn farmhouse bowl. 4. Fruits and greens tucked into open shelving – When we renovated our kitchen last year I couldn’t wait to put glass fronts in our upper cabinets. 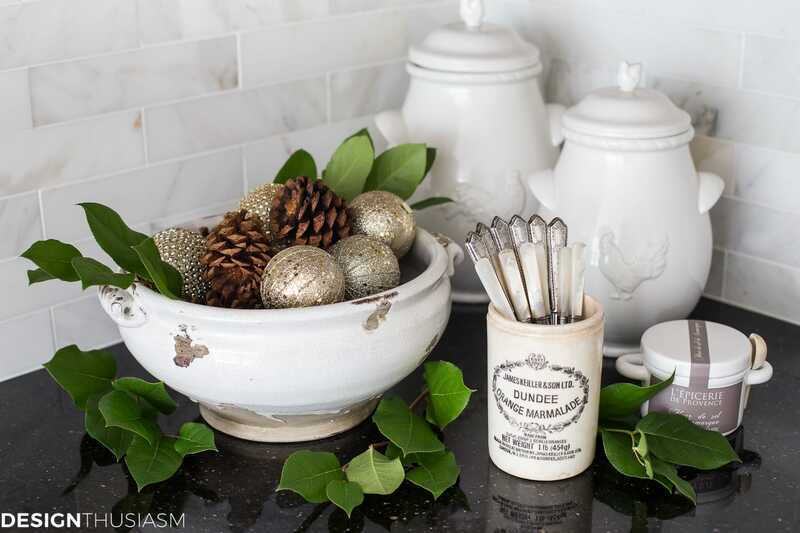 How fun it’s been to fill them with white dishes and for the holidays accent them with more natural elements. I used fruits and greenery here, as well, and the white backdrop underscores the presentation. 5. 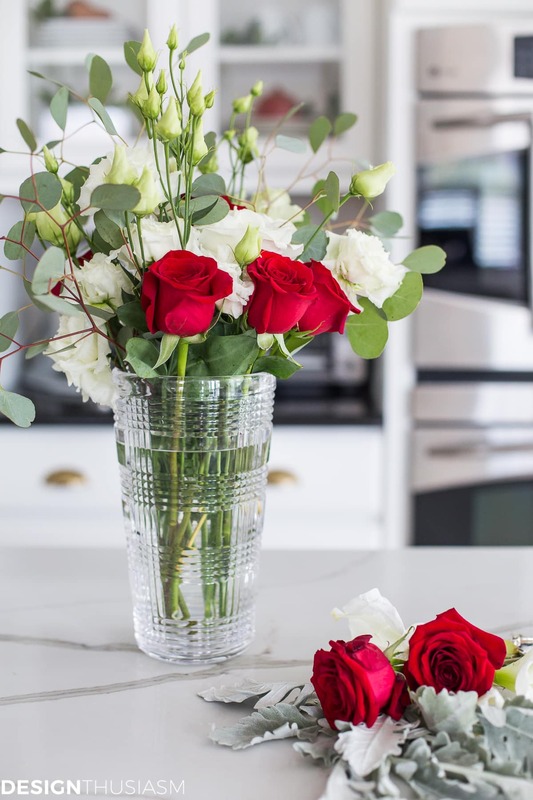 Gorgeous floral centerpiece – For me, always the most important part of any styling is the fresh flowers. 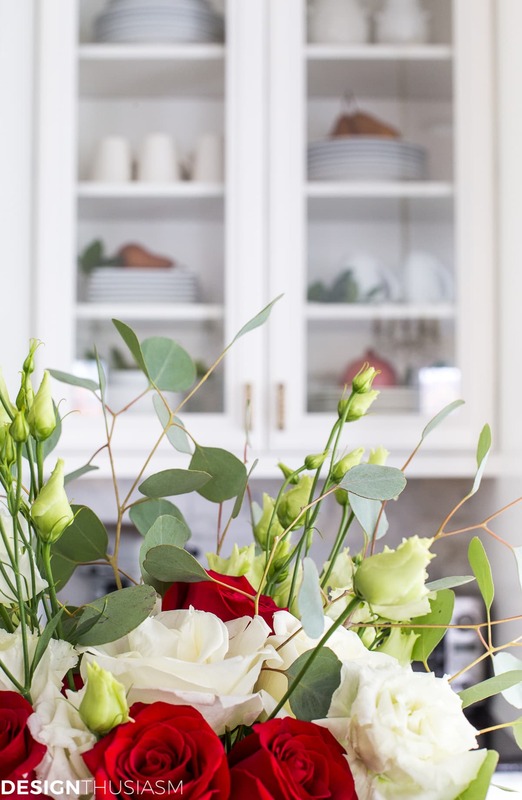 This floral is comprised of white amaryllis, white and red roses, seeded eucalyptus and a few other greens. I often let the greens begin to dry out and just replenish the flowers to extend the lifespan of the centerpiece. 6. 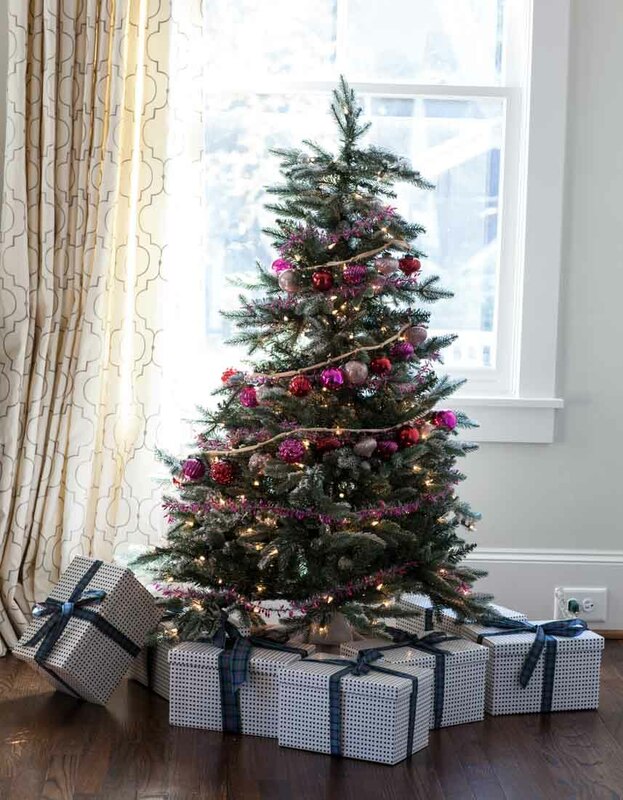 A charming mini tree – A sweet burlap-wrapped miniature faux tree sits comfortably on the counter anchoring the seasonal concept. Here it’s dressed with tiny ornaments, but I’ve used bows and other trinkets in the past, as well. 7. 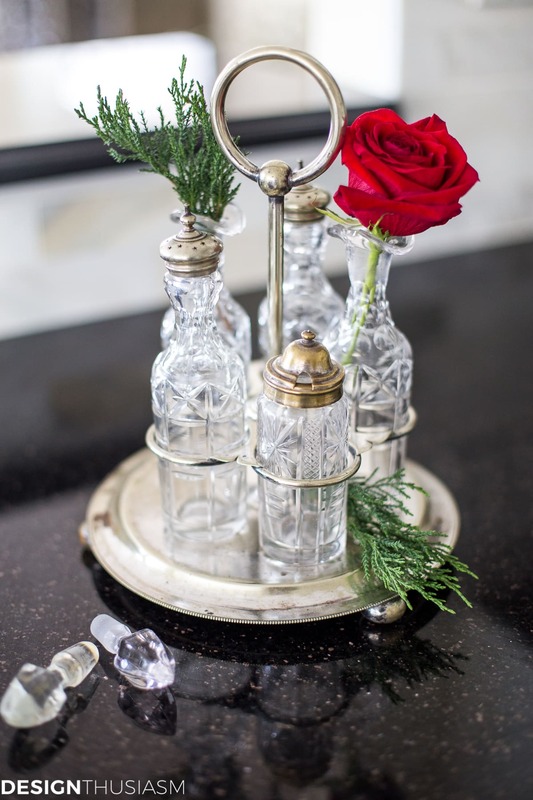 A bud and green bits in a vintage cruset set – Sometimes decorating can be as simple as embellishing your existing pieces with some sprigs of juniper and a well placed red rose. The vintage cruet set says French Country while the plants speak clearly to Christmas. 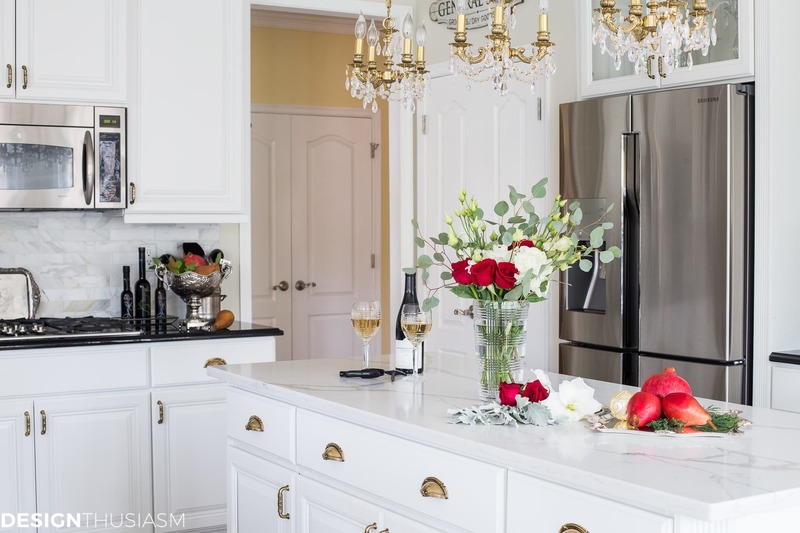 I love using elements that highlight my modern French Country decor while enhancing the look of my kitchen and not looking forced or over-the-top. They whisper of the holiday coming and hint at the celebrations on the way. Yet they also feel like they belong in a kitchen on any average Monday. Lots of ideas here! 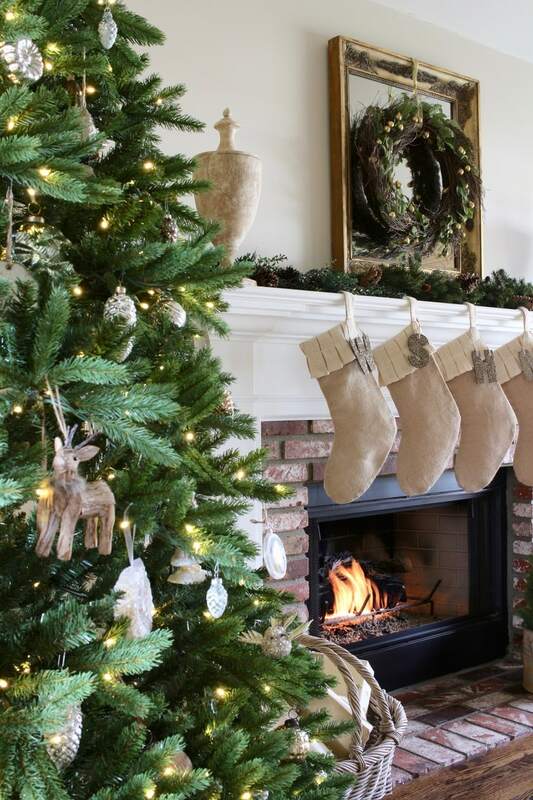 We are giving a big party in early December, and I will be adopting several decorations you show. I see pomegranates all over the market right now; I hope they are still in season (and still pretty) in a few weeks. The best part about using fruit is that you can eat it and you don’t have to store it! Exactly true!! And thanks so much… 🙂 The one problem with pomegranates, though, is that they’re expensive. But so pretty and very healthy! 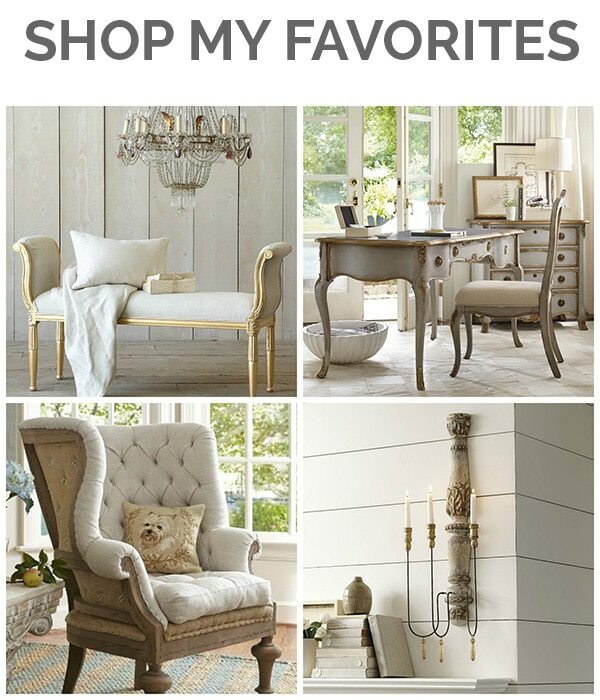 Lory, great tips for adding simple holiday style. 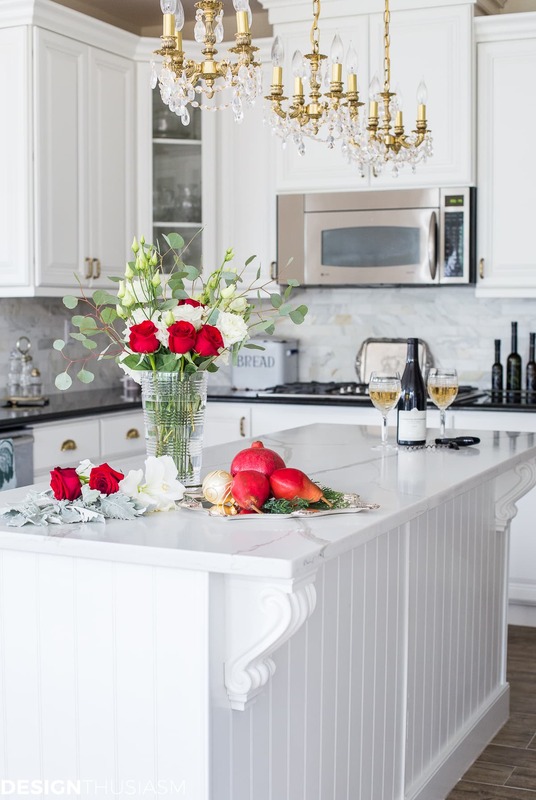 Your kitchen looks great with the pops of red and green along with the chippy and glam. Thanks, Kim!! 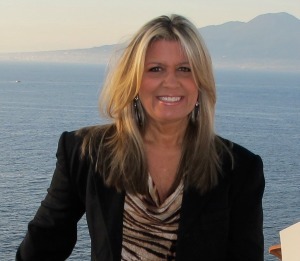 I’m all about the chippy and glam… lol! 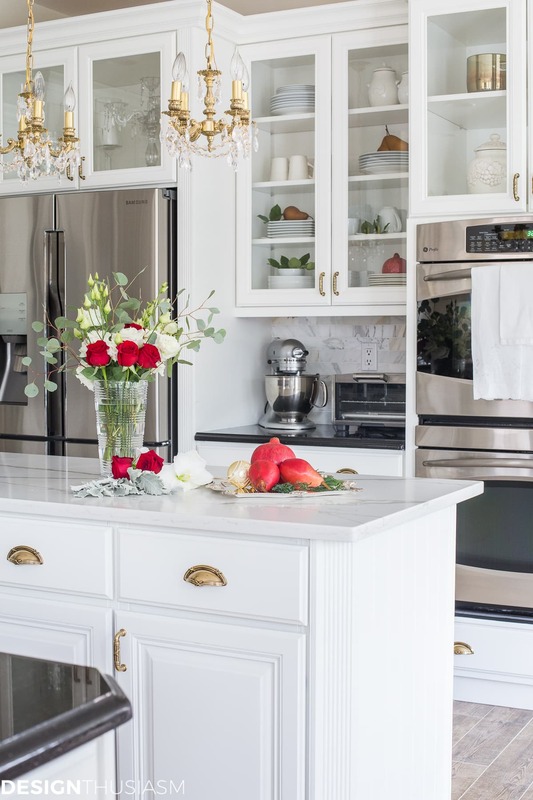 Lory, your kitchen is swoon worthy and I love the pops of red with the roses and pomegranates! Absolutely gorgeous! Happy Holidays, dear friend! Thank you so much, Cindy, and right back to you!! 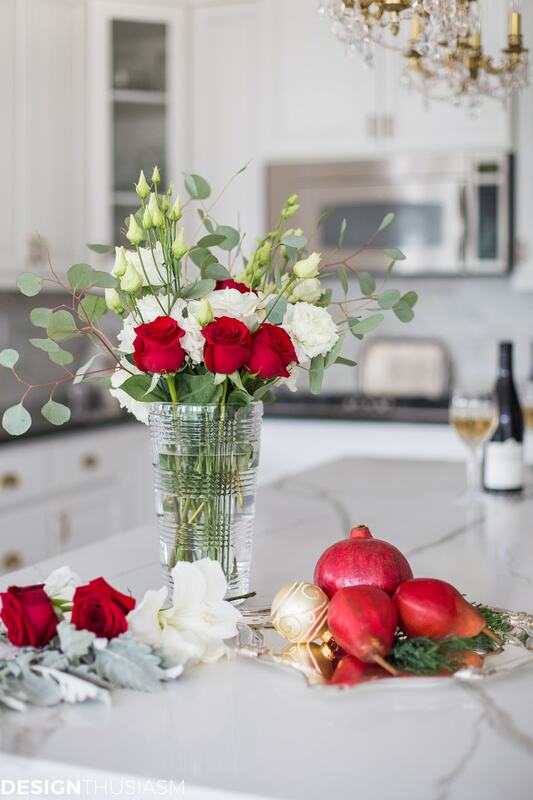 I have followed your kitchen remodel and so admire the beauty and function of this kitchen…You have so beautifully decorated this kitchen for the Holidays…love the use of the natural elements of the red used in your beautiful white kitchen. So beautiful Lory!! 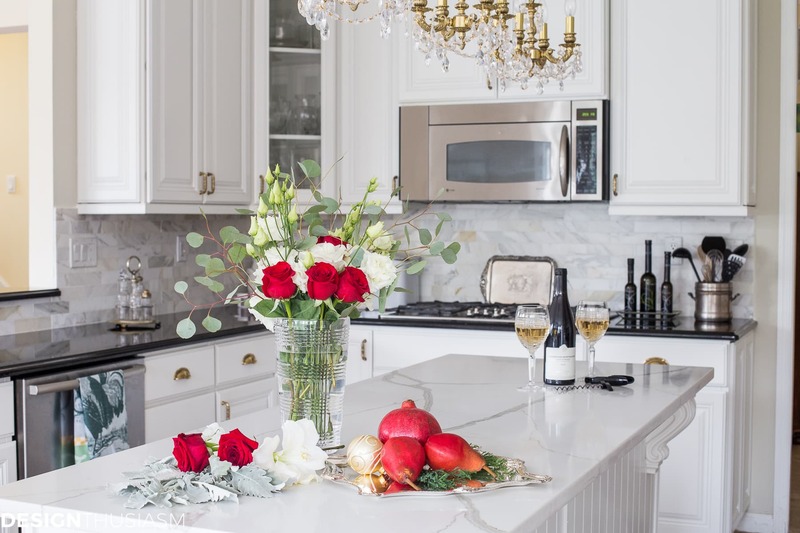 Just love your kitchen and pretty Christmas touches! 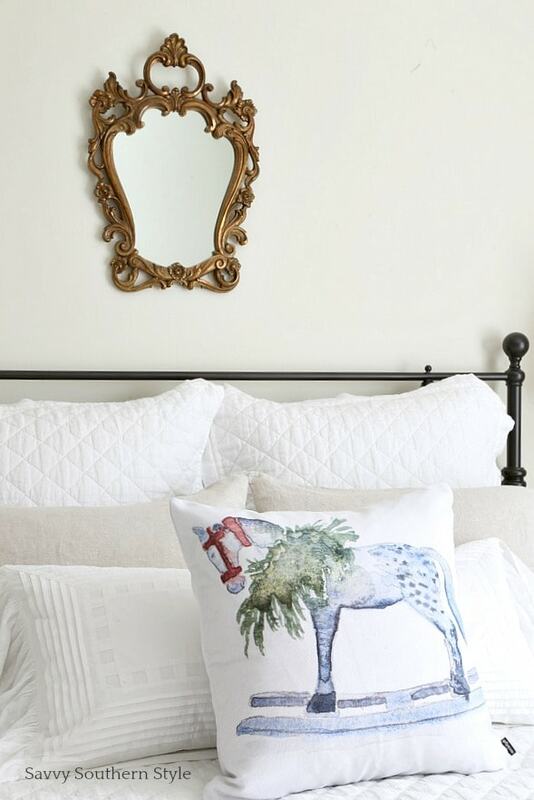 Your subtle touches really bring the season in, without going overboard. From your silver bowl (LOVE that!) to the red pears (also love!) to the charming marmalade jar are all so perfect for the space. I love that it is all “Christmas-y” without being over the top. Thank you so much for organizing such a great group – I’m so thrilled to be joining you! Lory, I love how you use seasonal fruits to decorate for Christmas in a kitchen!